Although I'm not rich and although I'm not poor, I'm as happy as them that's got thousands or more. I have sung those words hundreds of times in concerts from Brisbane to Birmingham, Aberdeen to Aitkenvale, and every time they reinforce the exquisite dilemma of a musician's life. The rich experiences of the last twelve years on the road, and the dear friends met on the way are the only real treasure trove to be had, but what riches! In 2000, John Thompson and I started our duo, Cloudstreet, and in 2002 we recorded our second album, got married and went on the road - and we pick up the story from where my last Folk Rag profile ended. We spent 18 months in the UK, where we infiltrated the folk scene with our terrible colonial ways, and recorded our third album with two brilliant and enduring collaborators from Essex, Vicki Swan and Jonny Dyer. Since that trip, we have toured six more times in the UK and made four more albums. We have lived in a campervan for four years and in Maleny for four years, and have been playing gigs which amaze us. Along the way I have played to five people at a time in Memphis, and 20 000 people at Woodford, met my heroes and added to my treasure of friends. I have directed the music for the Woodford Fire Event, taught singing in Maddy Prior's presence, made parade instruments out of aggy pipe with Welsh children, and had French Canadian super trio De Temps Antan play in my hotel room. What should I do with all that accumulated experience? After my mother died in 2011, I was asking myself big questions about meaning, especially during a three-month tour in the UK in 2012, when our constant life-in-motion started to unravel in a series of breathtaking events. John was contacted out of the blue by the Sydney Theatre Company and asked to audition for the Australian production of Warhorse. As we were gigging in Kent, he got on a train to London where he auditioned for John Tams. We continued our 8-night run of gigs and reached Glasgow. There he did a second audition by Skype from a Travelodge, and eventually he landed the part. The effect on my life was upheaval. At first, the change of pace was welcome, but then the big decisions caught up with me. How would I continue to perform, and earn a living now and in the future, while John was working in Sydney and Melbourne, doing 8 shows a week for months at a stretch? After 18 months of frenetic activity, I now have two choirs, five bands, one festival, one art business, two touring shows and a new tunes class on the go. The ongoing challenge involves the perennial musician's dilemma - how to juggle all the enticing activities into a living! The festival is the Maleny Celtic Winter School, which we founded in 2009 with other Sunshine Coast musos including Steve Cook, Jeremy Dunlop and Jenny Fitzgibbon. With classes in traditional music, a tutors' concert and a community ceili, it's getting more and more people playing celtic music every year. I also initiated the Maleny Tunes Class, spawning the Maleny Ceili Band, which has flourished with, at times, more than 20 players. I am now working with a collective of Brisbane musicians on a tunes class here, too. Morningsong is my Friday morning world music choir in Bulimba, along with the newer The Folk Choir in Ashgrove on Thursday nights, which sings an anglo-celtic repertoire. These choirs are all about singing for joy, with a few infrequent performances for fun. 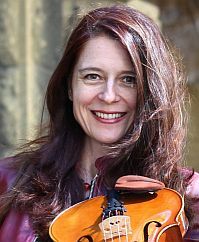 In 2012, Emma Nixon and I started a fiddlesinging duo called The Wish List, and in that busy year played in Northumberland, just after the Cloudstreet tour, and preceding an exhibition of my portraits of famous fiddle players, Fiddle Icons, in Northern Ireland. We made an album and played the National Folk Festival, and in 2013, The State Library of Queensland asked us to create a show for Queensland Week. With Rebecca Wright, we produced The Secret History of Queensland, a fiddlesinging, storytelling show with live sand-painting, which I do on a lightbox with beach sand. Since it's debut, we have reworked the show so it is now available for schools, as well as theatres. We are also working on The Great War, a moving show of songs, stories and period photos created by John Thompson since he finished Warhorse. That urgent blossoming of creative projects, which happened in 2012/13, also produced The Ceilidh Clan, a Scottish dance band with Rebecca Wright, Donald McKay, Emma Nixon, Davydd Macdonald and John Thompson. After the delight of introducing Rebecca and Donald to each other six years ago in Scotland, we have now scored a real Scottish dance caller since their move back to Australia! The bairn of the Ceilidh Clan is The Jiggles, ceilidh dancing for little kids, which is chaotic and so much fun. The fifth band was a sudden collaboration between our creative sharehouse and Cider House, when Steve Dorahy needed a rocking St Patrick's Day act to take to New Caledonia this year. With John, Steve, me and Keith Megson playing, and Davydd Macdonald playing and dancing, it was a high energy Irish show! I have seen a great deal by going out into the big wide world. One impressive initiative was a charity in the UK called Music in Hospitals. John and I worked for them, doing shows in all sorts of hospital settings across the UK, and extended tours in Northern Ireland and Jersey, where our most popular songs included Can't Help Falling in Love with You, and Waltzing Matilda. The rule they insisted on was, don't mention death. The other (unspoken) rule we discovered was: be able to sing Elvis. The beauty of their model is that local businesses sponsor a show in a local hospital, and the charity provides professional musicians with an income by engaging them to play the show. It's a beautifully sustainable way of keeping musicians working, hospitalised people entertained and helping businesses to support their community, and I would love to be involved in such a project here in Brisbane. If the right people got together to make it happen, dear folkies, the town would be ringing with chorus-singing and musicians would always be in work - spreading the riches around!